The Church of God Working Young Adult Volunteers were launched to practice the teaching of the Bible, “Be the salt and light of the world,” through worldwide volunteer services, and to spread Mother’s love to many places of the world. 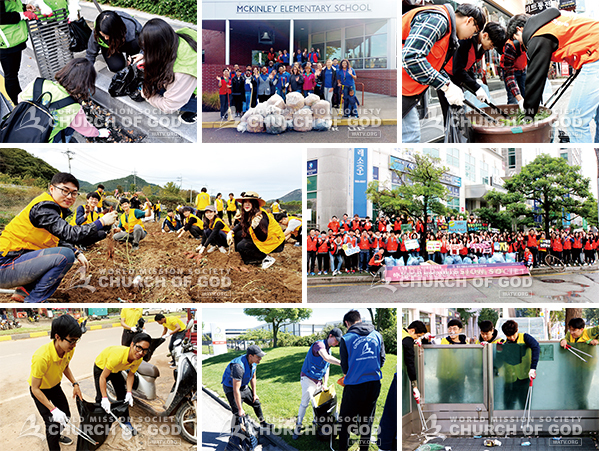 On Oct. 15, more than 6,100 working young adults around the world carried out different types of volunteer services such as environmental cleanups, aiding farm work, and helping senior citizens who live alone. The working young adults extensively cleaned Free Island Beach in Las Piñas, the Philippines; Lagankhel Buspark in Kathmandu, Nepal; around Taichung Intercontinental Baseball Stadium in Taiwan; around New Bumbugur Trade Center in Ulaanbaatar, Mongolia; an industrial complex in Hornby, New Zealand, and so on. The cleanups were also carried out in the U.S., Mexico, Peru, Thailand, Singapore, Cambodia, South Africa, and Australia. “Cleanups must be a continuous thing. We cannot stop because people are continuously littering. Our goal is to create a safe working environment and to raise awareness about environmental issues,” said Sister Kusile Kewana (Cape Town, South Africa) who cleaned Orange Street, wishing their volunteer service would be a turning point in chang-ing people’s awareness. In Korea, the young adults stretched out their helping hands not only to big cities like the Cheonggyecheon Stream and the Heunginjimun Gate in Seoul but also to small towns and rural areas. The street cleanups were mainly carried out near subway stations, in densely populated areas, and in local attractions such as Gongju Gongsanseong Fortress, a UNESCO World Heritage site, Tongyeong Cultural Center, and Youth Street in Dongducheon. They also collected trash diligently around industrial complexes that were not taken care of and in commercial areas that got dirty due to crowds of people. “Beginning a new week with a volunteer service freshens our hearts. 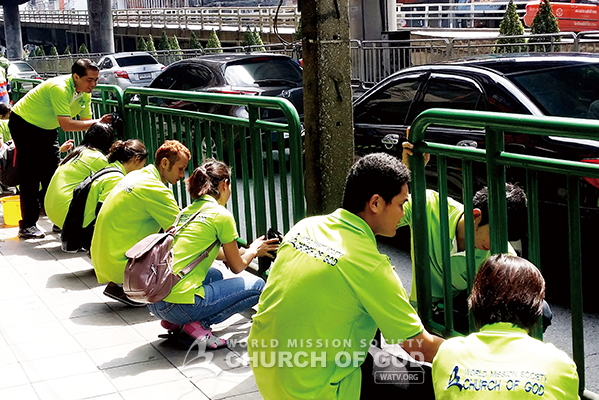 It feels like we won’t suffer from Monday sickness,” said the volunteers in unison, seeing the streets clean and fresh like the clear autumn sky. “While making efforts to display God’s glory with good deeds, I could change my mindset. Taking today as an opportunity, I’ll treat my colleagues at my work with a good heart and work hard,” Sister Lee Ji-yeong (Seoul, Korea) expressed her will. She also hoped many workers who suffered from stress all day long may get energetic and brightened up while walking clean streets. Some young adults in Korea helped harvest crops like sweet potatoes, turmeric, and ginseng and other farm work. Farming villages are where you can feel the demographic cliff. Farmers are worried though they have a bumper year, as it’s hard to find a worker even at high wages during the harvest season. In this situation, farmers could smile after a long while, seeing tens of healthy young adults gather. “People are selfish these days. I too was concerned only about my work. I was surprised to see these young adults work enthusiastically as if they’re working for their own farms. Where can I find such people?” thanked Lee Hwa-ja (Nonsan, Korea), an owner of turmeric farm. The volunteers were joyful, too. “If I just rested at home, today must’ve been spent meaninglessly. I was energized and felt rewarded through volunteer services,” said Sister Seo Ji-yeong (Daejeon, Korea), a service industry worker, with a bright smile. It’s not easy to actually do the voluntary work even though you’re willing. However, if you’re not alone but together, it’s a different story. The working young adults spent their days off together to make the world a better place as Christians. They finished the day’s volunteer service, hoping what they did would deliver the positive energy to their workplaces and become the motive power to change the communities.